I was trying to thinking of a breakfast recipe for New Year's Day that required minimal effort, yet really hit the spot if you'd indulged in one too many proseccos the night before. 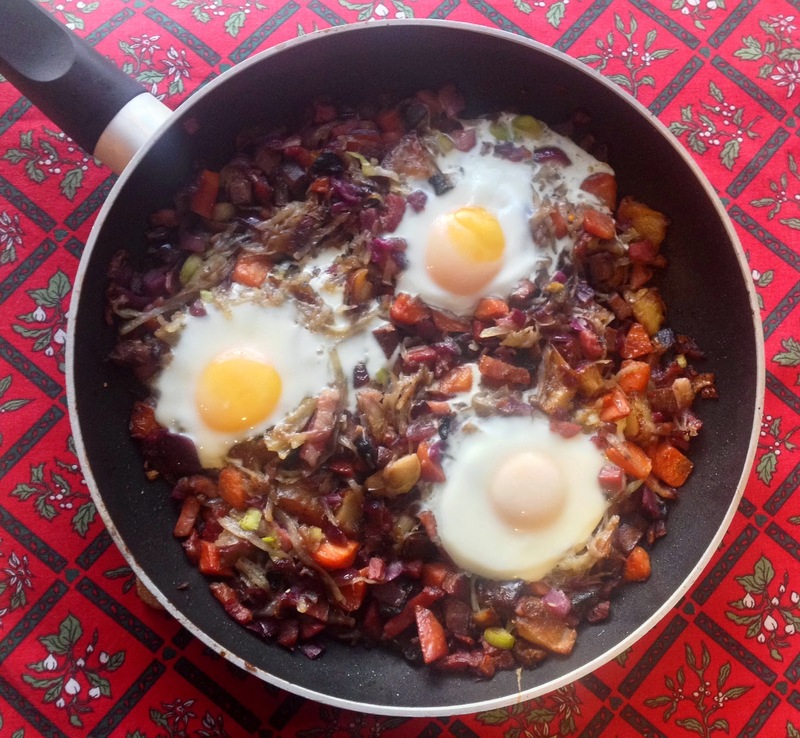 Poking around in the fridge after a week of Christmas festivities I realised there was plenty of food which needed eating up - why not throw it altogether to make a breakfast hash fit to cure the worst hangover? 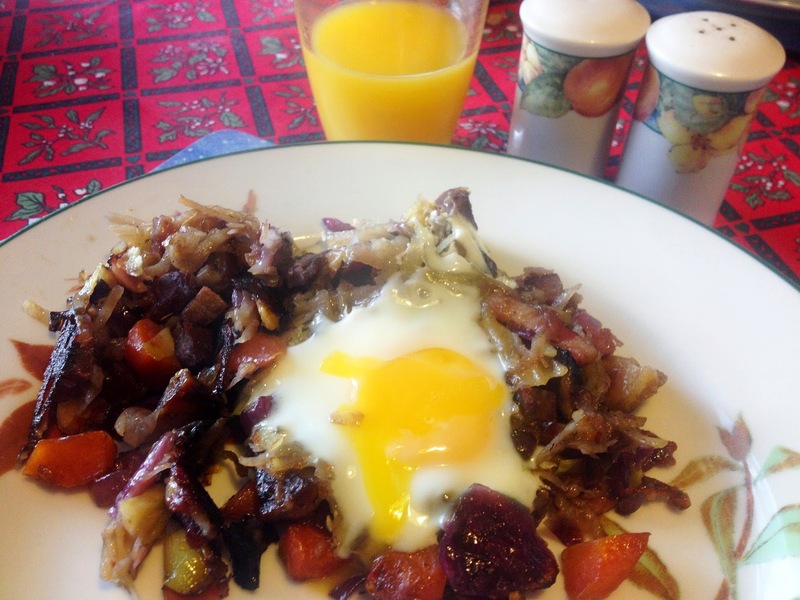 As Nigel Slater points out in this video, there are no rules when it comes to a breakfast hash. Just choose your base meat (leftover ham, turkey, or sausages), add flavour (onions, garlic, salt and pepper, or spice if you dare), grate in potato or use leftover mash or chopped up roasties, and crack in eggs towards the end. 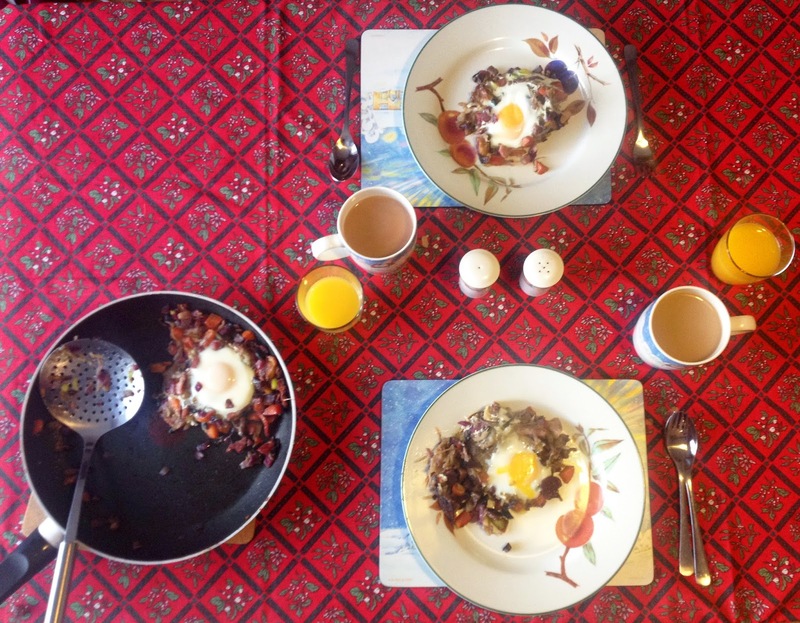 Even easier than a fry up if you ask me, a breakfast hash is a one pan, chuck-it-all-in kind of dish, which you place at the centre of the table so guests can help themselves to the meaty, stodgy concoction. Add a bottle of ketchup or brown sauce and a Bloody Mary and it might perk you up enough to leave the house for a New Year's Day walk. Fry bacon lardons and meat leftovers (goose and ham) in butter and a splash of olive oil. 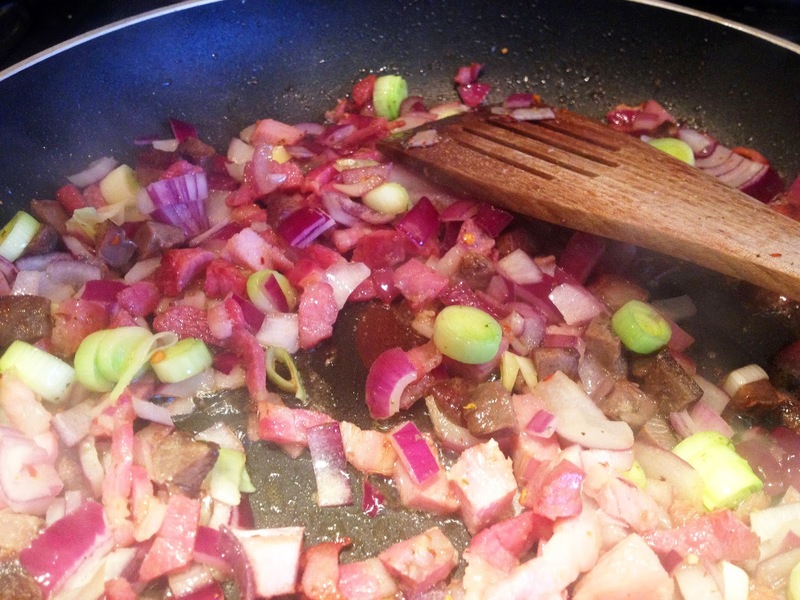 Add half a chopped onion, a couple of chopped spring onions, and season with pepper, a grind of garlic and chili and just a little salt - don't overdo it as there's a lot of salt in the bacon and ham. Add any leftover veg - I threw in chopped sprouts, carrots, roast potatoes. Grate a potato into a bowl, squeeze out the excess water, and scatted into the pan. 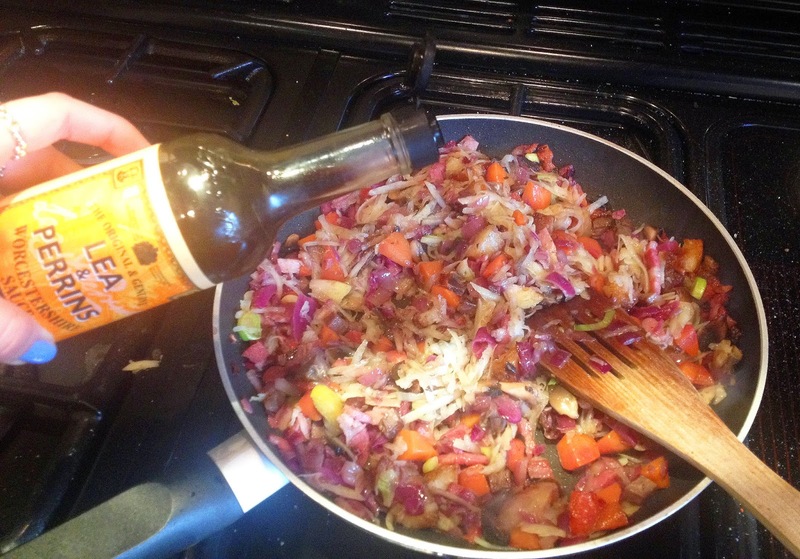 Add a few splashes of Worcester sauce. Crack in three eggs, turn down the heat slightly and cover with foil. 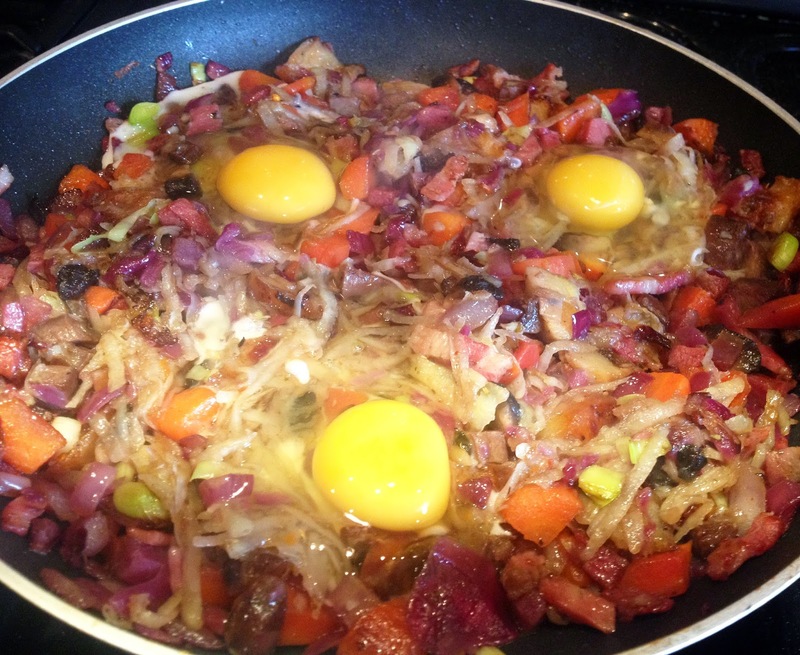 Serve once the eggs are cooked (about five minutes which allows the bottom of the hash to crisp up nicely). But seriously, use this recipe as a base and go wild clearing out your fridge. I really like the idea of cooking sausages a la Slater, but I wanted to use up the Christmas meat in my house. Want something a little more spicy to kick off your New Year? Try my Huevos Rancheros (Mexican Eggs) - eggs baked in a spicy tomato sauce with cheesy tortillas for dipping and a cool guacamole. Here's to a great 2015 everyone!